Just like with many new businesses with clean, white walls, echoing becomes an issue during meetings and especially when on calls. 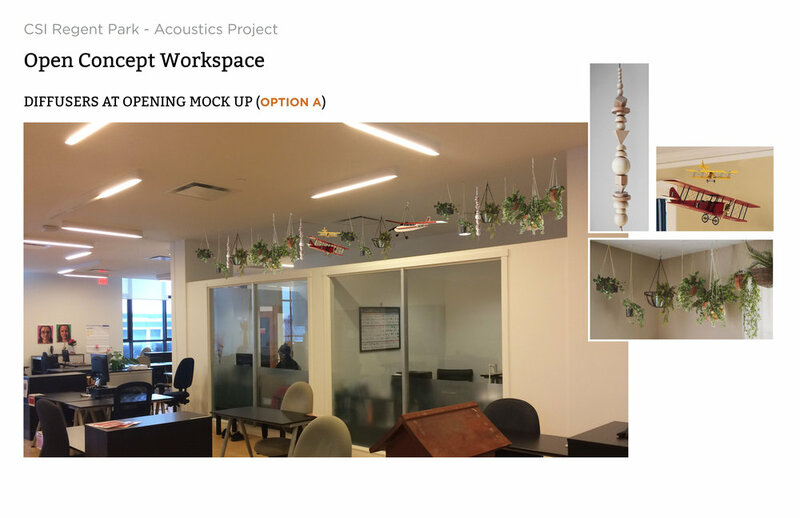 We worked with CSI Regent Park to solve their acoustic issues. Our initial focus was on one small and square meeting room (185 sq. ft.). 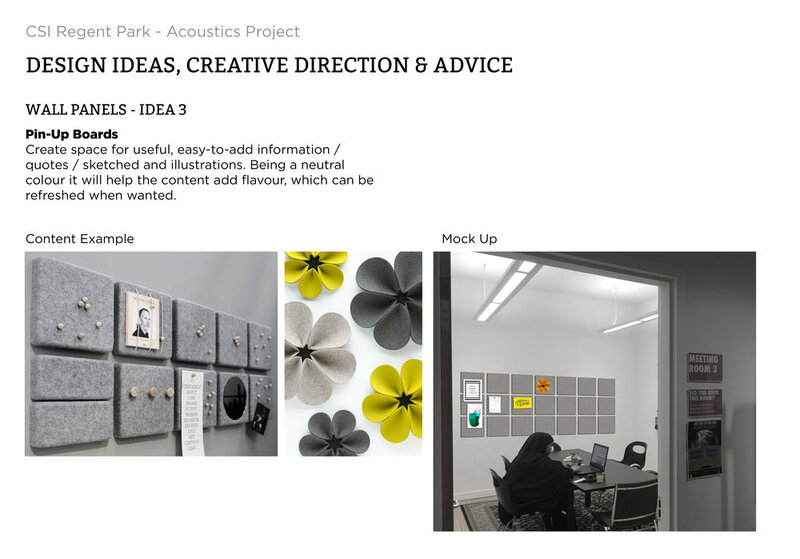 We started with a consultation, based on the origins of sound in the room, and first reflection points. Next, we calculated the amount of corner bass traps, ceiling and wall panels per room, the the desired level of noise reduction. Lastly, we gave art direction ideas as to how to add these panels as a light ambient proposal, as well as to create artistic centerpieces in the room. Scroll future down for initial concepts. 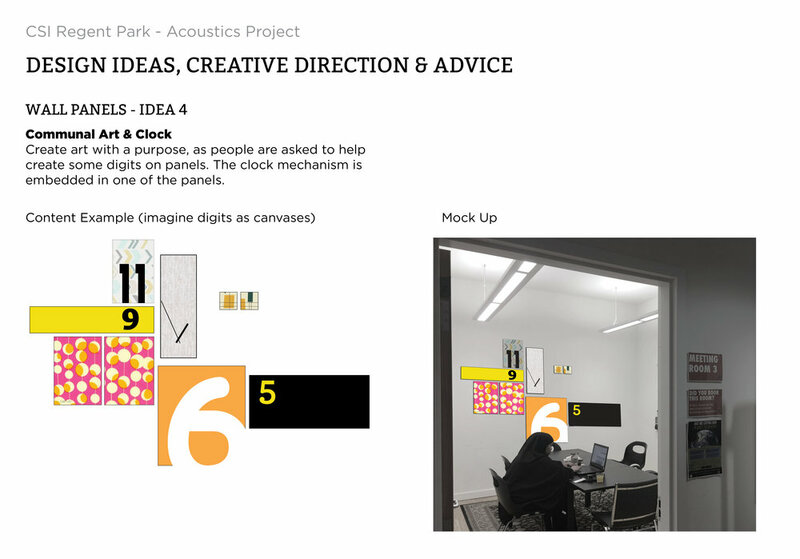 The acoustic panel art series was created as a part of a sound control solution. BEHIND THE ART: This four canvas series addresses our city street's beauty - the organization of lines guiding us through our everyday. They are invisible rules that keep us in tact, allowing us to flourish and coexist in harmony. There are subtle parallels between co-working spaces and these subtle city elements. Furthermore, this artwork comes with pins for members to contribute with photos, quotes, etc - adding to the ecosystem of ideas. A photo and quote came with the art - encoring everyone else to contribute. 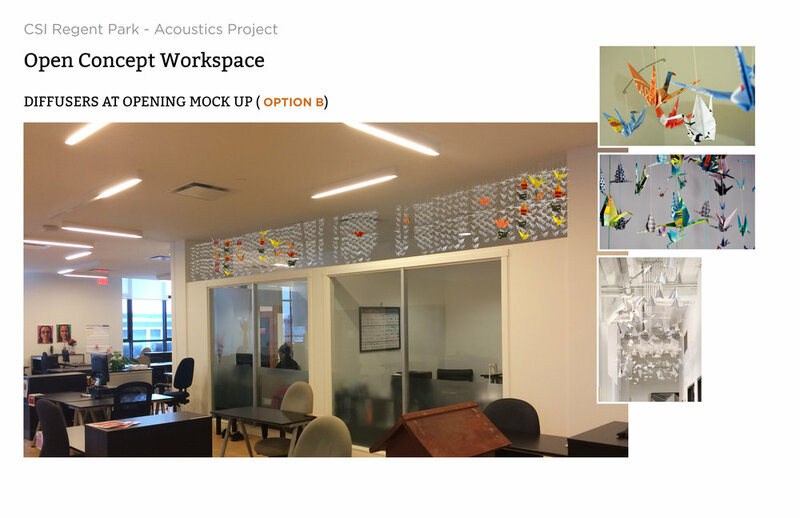 Our next effort was focused on recommending sound-diffusing solutions while keeping on theme with the CSI brand and values for a problematic open-concept work area.